"Awesome, considerate, and professional. I highly recommend." "I was so grateful to see how he cared...He is AWESOME!!" "I had my surgery performed by Dr. Gyang and he did a fantastic job." ""Five stars all the way! He's the best." Dr. Anthony Gyang specializes in chronic pelvic pain management and minimally invasive gynecologic surgery at his practice, Osceola Gynecology. Using the most advanced technology, he offers on site procedures include hysteroscopy, endometrial ablation, cystoscopy, ultrasound, urodynamics an colposcopy at his offices in Orlando, Kissimmee, St. Cloud, and Poinciana, Florida. Dr Gyang is a gynecologist and does not see Obstetrics patients. From well-woman exams and birth control to management of irregular menstrual cycles and menopause, Dr. Gyang offers the full scope of gynecologic care. He also provides the most advanced therapies available for chronic pelvic pain, including stem cell therapy, pudendal nerve blocks, and trigger point injections. After receiving his medical degree from the University of Ghana, Dr. Gyang obtained a postgraduate certificate in gynecology ultrasound from the University of Cardiff in the United Kingdom. He completed an internship at Howard University Hospital, then finished his residency in obstetrics and gynecology at Franklin Square Hospital in Baltimore. 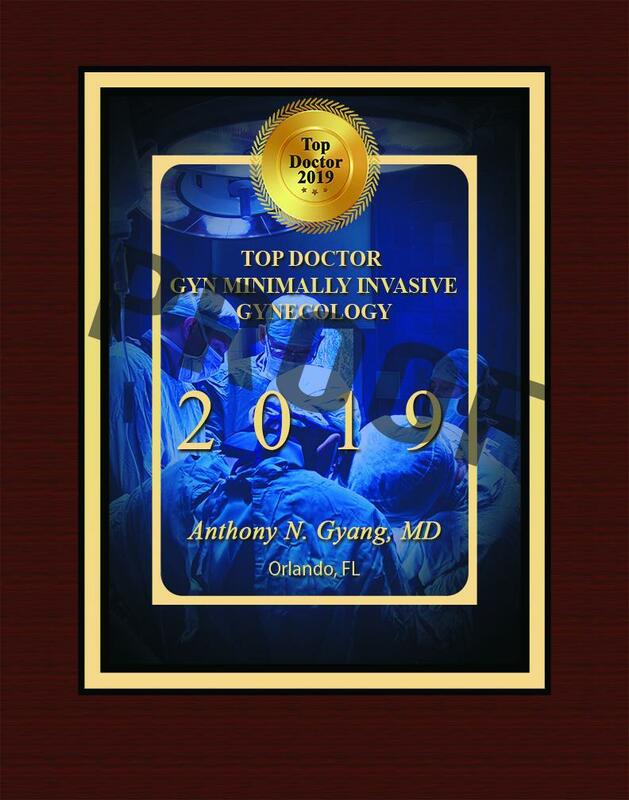 For the final step in his training, Dr. Gyang completed a fellowship in chronic pelvic pain and minimally invasive gynecologic surgery at Florida Hospital Orlando. He is board certified in obstetrics and gynecology. Dr. Gyang stays active in education by training residents from the University of Central Florida. He’s a fellow of the American Association of Gynecologic Laparoscopists and the American Board of Obstetrics and Gynecology. He also maintains active membership in the International Pelvic Pain Society and the International Academy of Pelvic Surgery. We want to make sure all patients feel cared for at Osceola Gynecology. We accept these insurances and self-pay, but if you have any additional questions about your insurance coverage, please give the office a call.